I have heard the cliché “Follow your heart” too many times. When you ask for advice, they tell you to follow your heart. When you have an important decision to make, they tell you to follow your heart. We now have so many heart followers and error makers. The Bible is clear on the state of the human heart. . . Your own heart is capable of deceiving you. I have been a victim of this at one time or another. 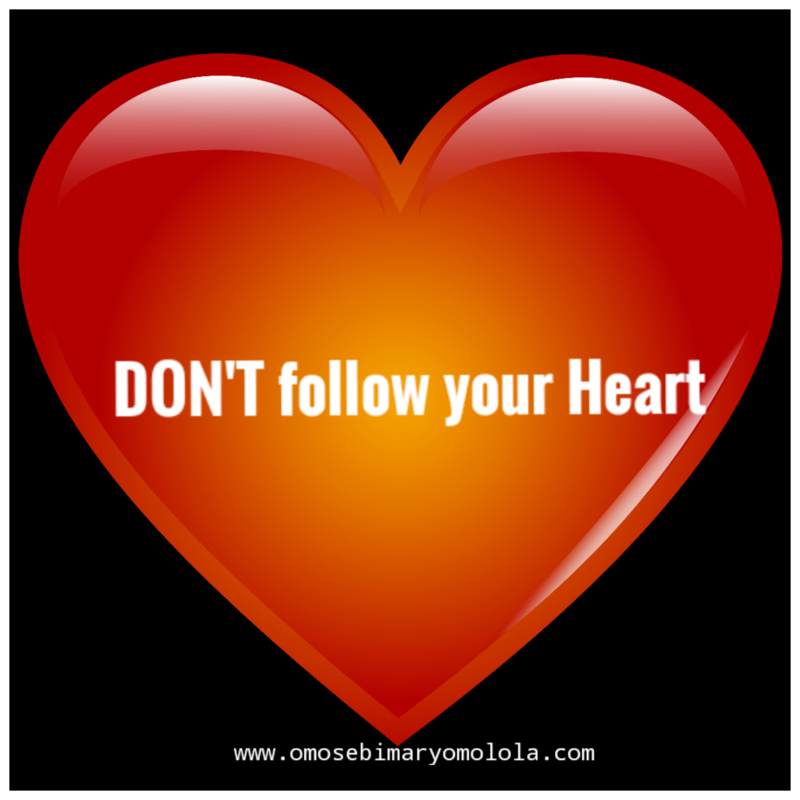 Even though I am not one to advice people to ‘follow their hearts’, I have followed my heart before and my heart led me astray. Your heart is the seat of your emotions and emotions are not reliable to lead you in decision making. Some argue that you can follow your heart as long as it is circumcised. Maybe so if that heart is truly filled with God. I believe that a circumcised heart however, will seek to follow God’s instructions at all costs. That heart has God as it’s focus and acknowledges God as the one at work in it. When you trust your heart to lead you, you are indirectly turning it to a god. Some people boast and say that their hearts are always right. They try to share the glory with God. The Holy Spirit is the only one who can lead you through the right path at ALL times. He is infallible. So, why gamble when there is someone who can sort out your issues without fail? Why take the path of chance when there is someone who is the Way and knows the way that you should follow? Let God be the shepherd of your soul. It is time to give up your heart following and follow God sheepishly. Decide not to go anywhere except God’s presence is going with you. Decide not to take any step except the Lord says you should. Depend on God totally. Rely on His directives from this moment onwards on EVERY issue. Move only at God’s Word. 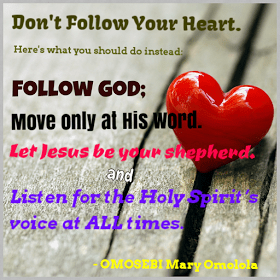 Follow God with all your heart. Let Jesus lead you. Listen for the Holy Spirit’s voice at ALL times. . .